RadiologyAssistant.org is a site devoted to helping students by offering information on radiology assistant degrees and careers. A radiologist assistant (RA) enhances patient care by extending the capacity of the radiologist in the diagnostic imaging environment. Radiology assistants must have excellent communication skills and the ability to interact well with patients and physicians in a fast-paced environment. Students are able to use their advanced knowledge to compare the findings from various imaging techniques and determine the best course of action for proper diagnoses and treatment. Unlike other trained medical assistant jobs that require constant supervision when interacting with a patient, radiology assistants are regularly left alone and trusted to take the best possible images of a patient. Radiologists are able to move on with treatment and advanced procedures, since an assistant is handling the images, which offers shorter wait times for patients. It is a rewarding field that is quickly growing and allows a student to begin working with just a few years of training and the proper certification. Florida Hospital College of Health Sciences . The BS in Radiologic Science from Florida Hospital College of Health Sciences provides working imaging professionals an expanded opportunity to learn the technical, medical and people skills they need for future career promotion. The curriculum is rich in science and math. The program is grounded in Christian principles and provides an excellent learning environment. Radiology assistants are trained radiologic technologists and work with x-rays and other imaging equipment to get the best possible image for nurses and doctors. You work under the supervision of a radiologist, although a radiologist is not necessarily with you for every imaging session with patients. Often radiology assistants help the radiologist with dealing with patients, final reports, and diagnosis. This helps remove some of the workload from radiologists, and also offers radiology assistants autonomy and independence in the workplace. There are many online radiology assistant programs to choose from. Ensure that any school you look into is approved by the AART. If the program is not approved by this organization, you may have issues applying for their exam, which vastly improves your career opportunities. Many employers will not consider students who are not certified by the AART and there are separate certifications for all levels of radiology, including technician, technologist, assistant, and radiologist. Online radiology assistant programs are ideal for students who have experience working as a radiological technician or technologist. You may be able to set up clinicals with your previous or current employer and can attend courses online, which allows you to continue to work. Many students in radiology assistant programs have been in the work force for a number of years, which can make it difficult to return to school full time. Online courses offer the flexibility and ease for students who need to work full time, but also want to advance in their careers and increase their earning potential. Browse through the different online degrees below that can help prepare you for a career in radiology assisting. Can Anyone Become a Radiology Assistant? Nearly anyone can become a radiology assistant. The biggest concern for employers is experience and proper certification and licensing. Most states require the same license to work as a radiology assistant, but some individual medical facilities may require you to work for a year or longer before hiring you full-time. This depends on the need for a radiology assistant at that facility. Radiology assistants usually attend two or four year programs. 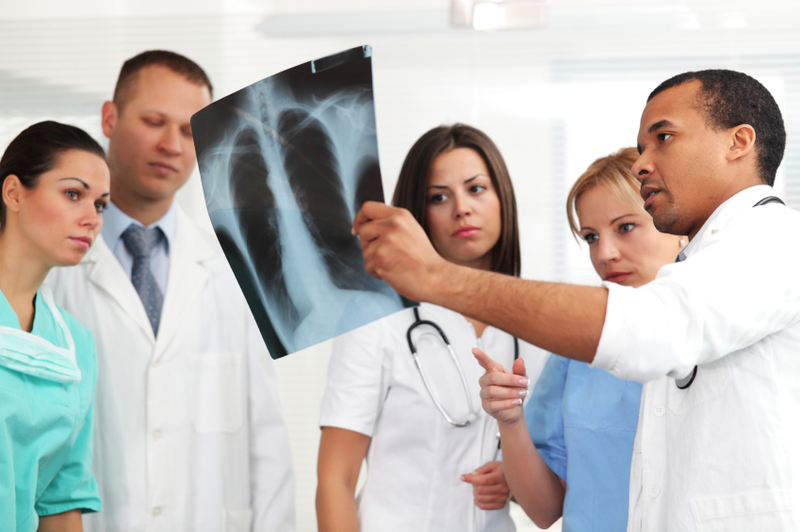 Several traditional schools and online programs offer an associate’s or bachelor’s degree in radiology assistance. Those who currently work as radiological technicians can also become certified through training conducted at an area hospital. These programs typically revolve around a certain number of hours completed before a student can sit for the licensing exam. If a student works as a radiological technician, the facility they’re employed by will sometimes fund a radiology assistant associate or bachelor’s degree. There are far more two year programs in the United States for radiology assistants. Most schools offer an associate’s degree in the subject. The number of accredited bachelor’s degree programs is very limited. Do I Need Certification to Work as a Radiology Assistant? Most medical facilities require all radiology assistants be certified by the American Registry of Radiologic Technologists (ARRT). The AART sets the rules and regulations for all radiographers and sets the standards for how protocol should run in any medical facility that takes images of patients. Certification should be in good standing when students apply to any higher education courses or additional training to practice advanced radiography methods. States require radiology assistants to renew their license every few years. The good thing about AART certification is it transfers from state to state. If you are trained and begin working in one state and make a big move, you will be able to utilize your skills and gain employment soon after. Should I Work as a Radiological Technician First? Ideally, the position of radiology assistant is an advanced version of the radiological technician. Some programs, such as four year bachelor’s degrees, do not require you to work in the medical field before entering the program. Others will require a student to have a year of experience as a radiological technician. Previously, the role of radiological technician was enough to assist patients and help radiologists on a daily basis. Because of a growing population and more patients who need imaging done, the job of radiology assistant has emerged. This is between a radiological technician and a radiologist. It does require more training and practices advanced techniques than a radiological technician, but assistants are not allowed to diagnose or treat patients like a radiologist can do. Radiology assistants may not always have a four year degree and it is not a prerequisite to obtain the position. Experience and proper licensing are the main concerns for radiology assistants. Radiological technicians and radiology assistants both need training and licenses in order to work, and it does help to have a background in radiology before beginning an assistant program. What is a Radiological Technician? This is the entry-level position in radiology. A radiological technician works positioning patients, conduct x-rays, mammograms and CT scans, as well as operate machinery properly. To become a radiological technician, one must enroll in a two-year program, which is offered online, through community colleges, trade, and vocational schools. Radiological technicians may also help with data input and patient paperwork. The main duty is to work to take the best possible images, so the physician can have a clear look at the area in question. What is a Radiological Technologist? What is a Radiology Assistant? The position of radiology assistant is the last position that requires limited training. Beyond this position, it is required for a student to have a master’s degree or higher to work as a radiologist. Radiology assistants are the second in command and often oversee a team of technicians and technologists. Because this is a fairly new position, there are only a certain number of degree programs. Radiology assistants can help diagnose patients, although the final decision is left up to the doctor. Assistants work one on one with patients and the ability to assess the issue and offer treatment, much like a radiologist. For patients that may need to visit the office regularly, but only need ongoing treatment and do not need a new diagnosis, the radiology assistant may be the primary contact. As mentioned, this frees up the doctor to see new patients and treat them. Do You Complete Clinicals to Become a Radiology Assistant? For working in any area of radiology, clinicals are required. This is the case for two and four year programs from any school. Most employers will not consider candidates who have not completed the proper number of hours for clinicals. Once you complete your clinicals, you are allowed to sit for the ARRT exam. It is important to complete clinicals with enough time to sit for the exam when finishing school if you plan on working right after. You can also complete your program and continue with clinicals. Many schools are affiliated with local hospitals, clinics, or doctors’ offices, which gives you the opportunity to conduct clinicals. The majority of programs have students complete course work during the first portion and move on to clinicals for the latter half. Because so many students who work in radiology have previous work experience, you may be able to set up your clinicals with a past employer. This has to be approved by your radiology assistant program, but most of the time, it is acceptable and students can continue to gain experience in an atmosphere they are comfortable with. For programs that are an extension of traditional schools, you may have a limited choice for where you complete clinicals, since established programs often work with only one or two facilities.